Mitch McLain attempts a deflection Friday against Bemidji State. McLain had a goal and an assist against the Beavers (Photo by Jessi Renner/BGSUHockey.com). The scoreboard didn’t see any action until 10:41 of the second period when Brandon Kruse’s wrist shot beat Michael Bitzer five-hole. The Beavers responded at 6:19 of the third period but that would be the end of Bemidji State’s scoring for the night. Niko Coffman scored the game-winning goal with just 1:12 left in the third period and then Mitch McLain finished the 3-1 win with an empty-net goal at 19:31. The Falcons’ game-winning goal was extra special for Niko Coffman. The sophomore defenseman had played just a single game his freshman season, frequently scratched as the 7th or 8th defenseman. This season Coffman has been called on due to injuries on the Falcons’ blue line, appearing in 11 games. He’s scored a goal and an assist for the Falcons this season along with a +2 on-ice rating. The Falcons killed off all five Beaver power-play chances Friday night (5-for-5) and allowed just eight shots on those attempts. Bemidji State was converting 24% of their power-play opportunities entering Friday’s game. The Falcons continue to skate without a full cadre of players. Junior forward John Schilling, junior defenseman Chris Pohlkamp, and freshman defenseman Carson Musser are out with upper-body injuries. John Wagner of the Toledo Blade reported that the hope is Schilling and Musser will be available after Christmas. Lukas Craggs exited Friday’s game at 2:02 of the second period after being called for a five-minute major and game-misconduct penalty for contact to the head (roughing). The infraction is Craggs’ second game-misconduct which places him in danger of a future suspension. NCAA rules stipulate that a player is suspended for one game after collecting their third game-misconduct in one season. Bowling Green is the fifth most penalized team in the nation, averaging 15.4 penalty minutes per game. They’re also the most penalized WCHA team with 17.1 penalty minutes per game in conference action. The Falcons had seven penalties Friday, accumulating 25 penalty minutes. After being pulled early in his past two games of action freshman goaltender Eric Dop settled in early for the Falcons. Dop had 24 saves on 25 shots faced. The Beavers’ goal came after Dop and defenseman Adam Smith miscommunicated about how to play a puck behind the Falcons’ net. The Beavers forced a turnover and Mike Soucier was left all alone in front of Dop, burying his chance high. Dop is 4-3-1 overall this season with a 2.70 goals allowed average and a .896 save percentage. He’s fared better in conference-only games, accruing a record of 3-2-1 with a 2.44 GAA and .905 save percentage. 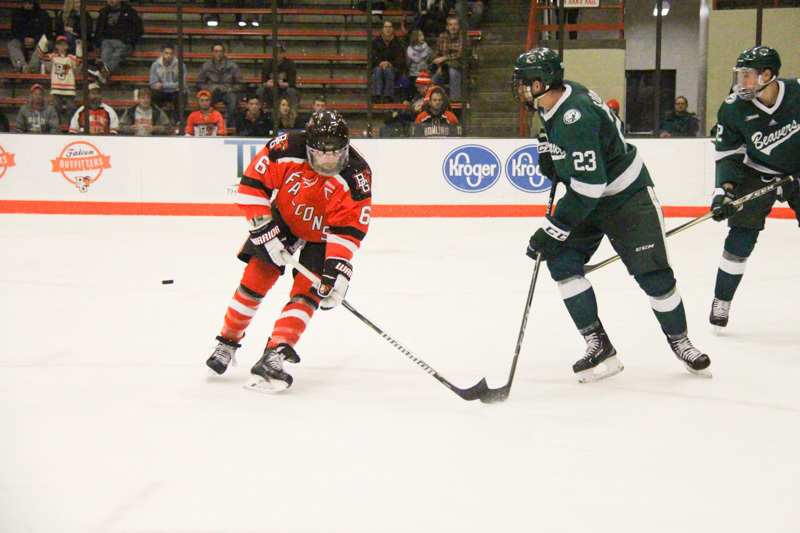 With Friday’s win, the Falcons moved to first place in the WCHA with 23 points. Minnesota State moves down to second-place with 21 points but will have two games in-hand after this weekend. Ferris State shutout Alaska-Anchorage, 2-0, Alaska handled the Lake Superior Lakers, 5-3, and Northern Michigan earned a 3-1 decision over Alabama-Huntsville. 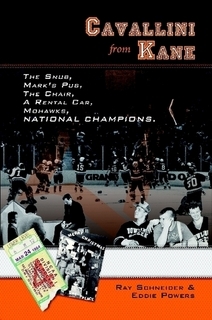 #8 Minnesota State and Michigan Tech were off this week. After wrapping up their weekend series with Bemidji State the Falcons will welcome Alabama-Huntsville next weekend to wrap up their first half of WCHA play.